This page gives a short introduction including some screenshots to the new visualisation features in TOPCAT Version 4 (beta release in v4.0b March 2013, first non-experimental release v4.1 March 2014). Density colour coding for all plot types, with density colour map based either on dataset colour or chosen from a fixed set. This gives a hybrid scatter/density plot. Flat, transparent and aux colour coding still available as before. Several features have been introduced to provide more meaningful visualisation of large datasets. Improved density-like plots and contours give you better ways to understand plots containing many more points than there are pixels to plot them on. There is separately some improvement in scalability: up to roughly 10 million points is currently feasible depending on available memory etc, though it depends what you're doing. However, I hope to improve this limit in future. Many more options to influence plot appearance. 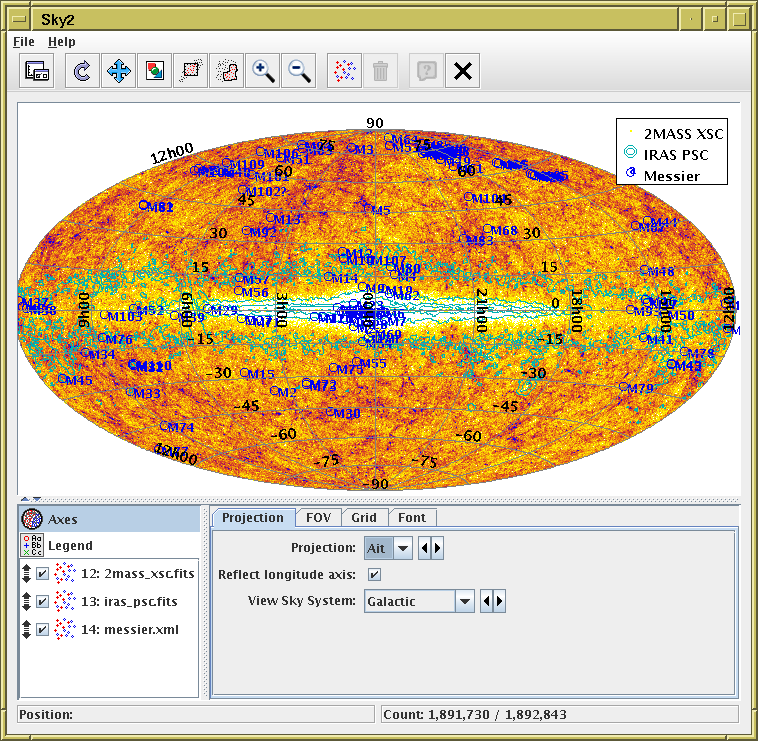 This is a colour-magnitude diagram of 8 million points from the Gaia Universe Model Snapshot simulation of the Large Magellanic Cloud. Points are plotted individually, but where multiple points are overplotted, the colour is darkened. This colouring mode, known as "auto", is now the default for 2d, so scatter plots will initially look like this. For non-overlapping points (in a crowded plot, outliers), it's exactly the same as a normal plot with opaque markers ("flat" mode), but it's also easy to see where the overdense regions are. It is something like what the density map (2d histogram) or plot with transparency did in classic TOPCAT plots, but with those capabilities it was hard to see both the overdense regions and the outliers at the same time. Below is the same data with some adjustments to the plotting. The colouring mode "density" is now used, with a rainbow colour map. This makes it easier to see the density structure for a single-component plot, but can be confusing if multiple datasets or row subsets are being plotted at once. Additionally, density contours have been overplotted in black. Slider controls make it easy to change the scaling and position of both the contour and colourmap scaling, so you can sweep the lines and colouring around to see where the interesting features lie. The axes have been labelled using LaTeX typesetting to get subscripts etc. Positional plot of the same data as the previous item. This plot is similar, but this time showing Galactic Longitude/Latitude on sky axes. Although the supplied data coordinates are equatorial (RA/Dec), an option in the Projection tab of the Axes control projects them into galactic coordinates. It's easy to see here various artifacts of the simulation. Density shading can be done on 3d plots as well (it looks better when you can rotate it). Note that the use of density shading in 3d presents some problems that do not arise in 2d, to do with where in the depth direction the opaque density pixels are considered to lie. As a rule of thumb, only use density shading for single-dataset plots, or prepare to be visually confused. The default colouring mode for 3d plots is therefore flat, not auto as it is for 2d. 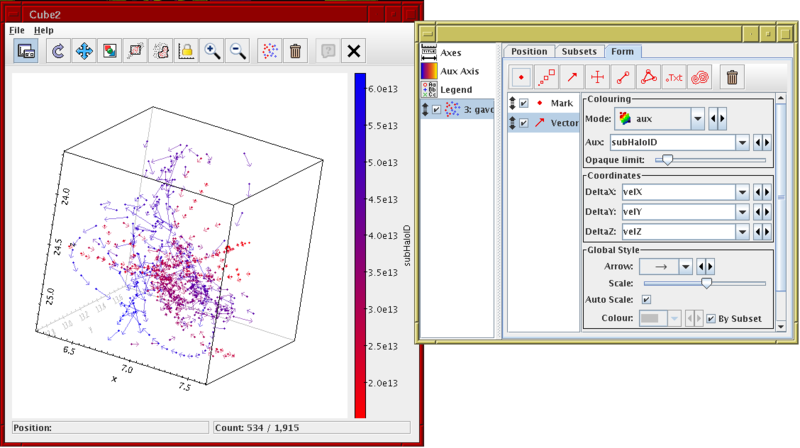 This shows some 3D simulation data with positions and velocity vectors. Points are also coloured by an ID value. To look closer at a particular part of the plot you can right-click on the relevant point to recenter it in the cube, then you can zoom in and out with the mouse wheel (the wireframe cube stays the same size, but the data volume in it gets bigger or smaller). This makes it quite easy to navigate around the data at various scales. Dragging the cube with the left mouse button rotates it. 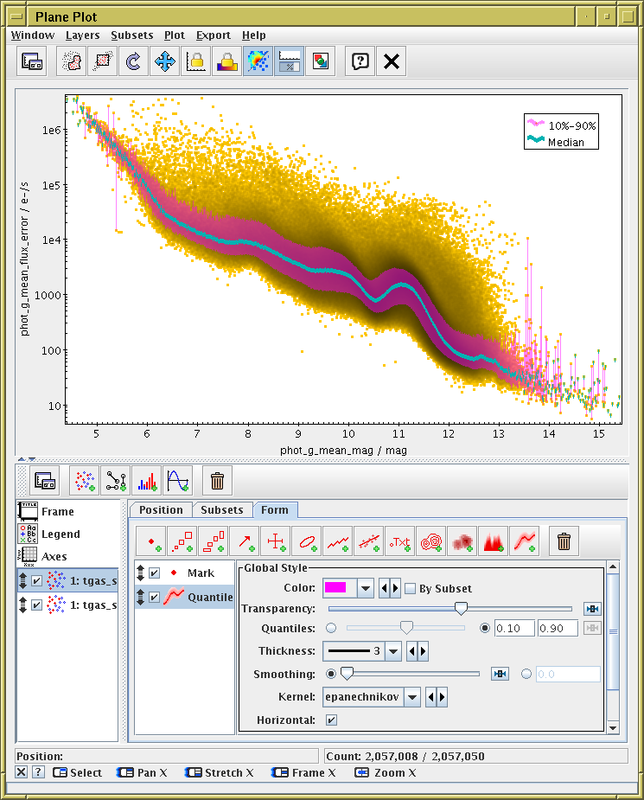 The Auto Scale toggle in the control window means that the arrow lengths are automatically scaled to be a sensible size for the plot; this scaling can be adjusted interactively using the Scale slider. Here the control panel has been floated out of the plot display window into a separate window for convenience, using the leftmost button in the toolbar ( ). 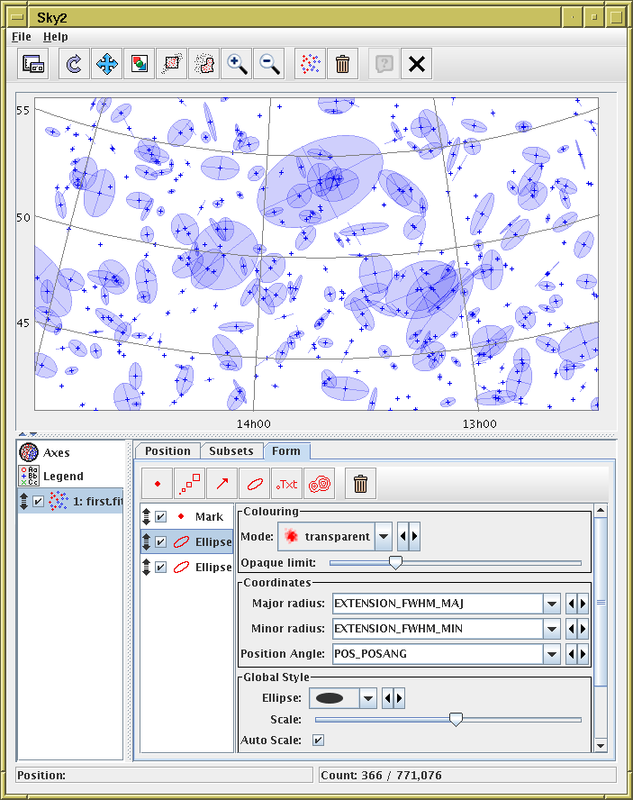 This shows part of a sky plot with galaxy positions and ellipses (defined by major radius, minor radius and position angle). Here the ellipse sizes have been artificially inflated (using the Scale slider) for effect. This is an all sky plot using the Aitoff projection into a galactic sky system. 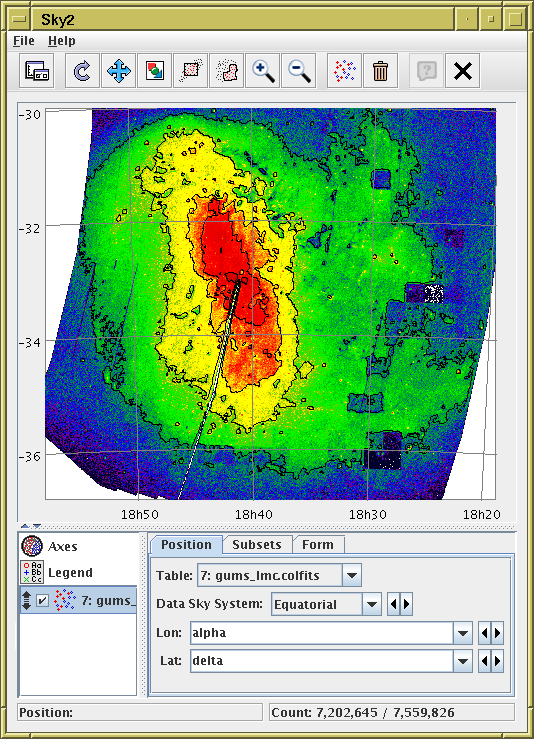 Three data sets are overplotted; the 2MASS extended source catalogue as a density plot with a yellow/purple colour map; the IRAS Point Source Catalogue using cyan contours, and Messier catalogue point sources plotted and labelled in blue. This shows the input catalogues and results for a crossmatch. The input catalogues are plotted in magenta and cyan respectively. Each output row (matched pair) is shown as a line between the matched positions. This can be very useful to see which correspondences the crossmatch actually made. 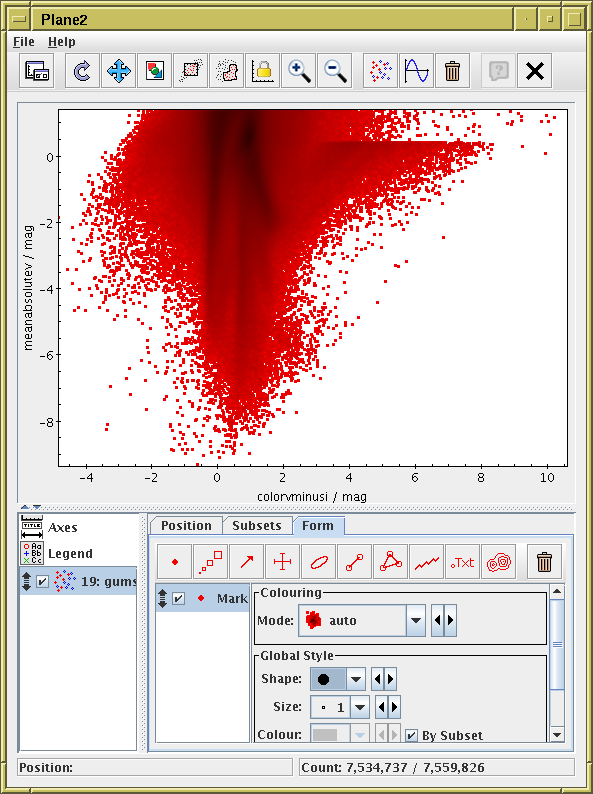 This plot shows markers scaled in size by one of the table columns. Two different subsets of the same table are shown. 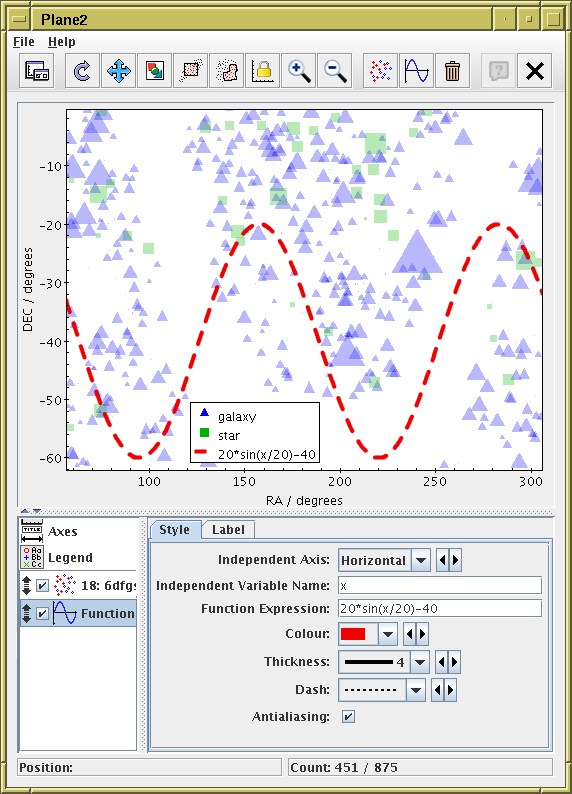 A sine curve has been gratuitously plotted over the result to show how analytic functions can be displayed. 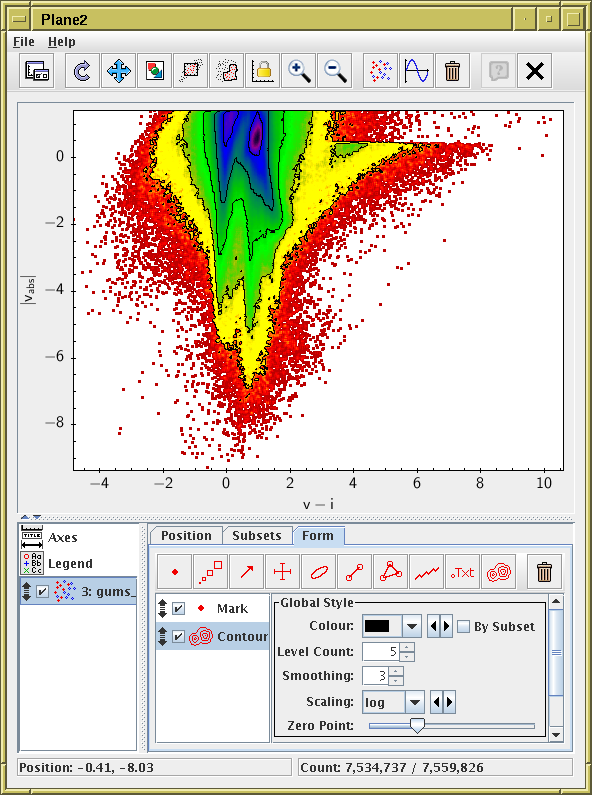 This plot shows how you can trace the median and other quantiles of a plot to display the trend of a noisy scatter plot. Two Quantile layers are used, one filling the region between the 10th and 90th percentiles, and one the median. Smoothing can be applied to get rid of the noise if required, though it has not been in this case. As in the classic plots, as soon as you open one of the plot windows, as long as you have a table loaded and selected, you will usually see a starting plot, and you can play around with the controls to get what you want. The control stack on the bottom left initially has fixed entries, for configuring plot Axes, and the Legend. Below that is a list of plot layer controls. To start with, one is automatically present, but you can add more using the controls in the lower tool bar. Selecting any of these controls by clicking on the stack entry on the left shows a panel with multiple tabs on the right. Explore these tabs for configuration of the plot. Some of these tabs in turn (Subsets, Form) have similar control stacks: click on the entry in the stack on the left to see the corresponding configuration panel on the right. 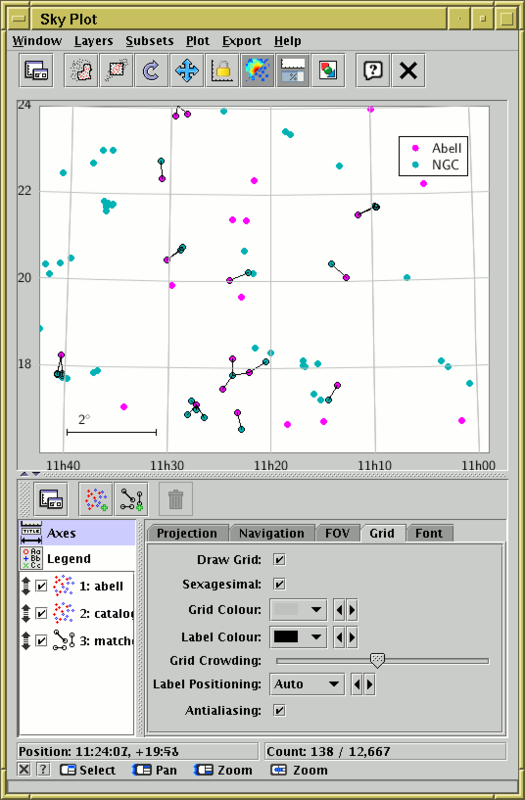 Each of the control stack items in the list has a checkbox, which you can (un)check to (de)activate that control, and a grab handle, which you can use to drag it up and down to change the position of the corresponding plot layer(s); items lower down the stack are plotted over (and hence may obscure) items higher up. Selects the table and basic positional coordinates. Selects per-subset characteristics for each subset in the table (there may be only one); principally colour, but also the label to use in the legend, if any. Provides another control stack and a load of toolbar buttons for adding different marker types etc. All of these use the basic positions in the Position tab and the subset characteristics in the Subsets tab. You get a Mark form to start with, but you can add more by clicking on the mini-toolbar. Select the control to configure it. Some of these options require you to enter more data coordinates to specify them, so the plot will not change until you enter those. Play with the Colouring Mode to adjust appearance. Most of the controls in this tab are Global, i.e. affect all subsets but at the bottom is a Subset Style to set style items differently for different subsets. Note that setting colour per-subset is usually best done in the Subsets tab though. The whole control panel at the bottom of the plot window can be floated out into a separate window by using the Float Controls ( ) button in either of the toolbars. This may be particularly useful if you have a screen with not many pixels vertically. Once floated, the control panel can be returned to the plot window by closing it, or by hitting the same button again. The controls are generally more responsive than in classic plots: any change to the controls updates the plot immediately. The GUI is somewhat more complicated to drive than for the old-style plots, and may be changed in a future release depending on user feedback. However, the hope it should be easy to make straightforward plots, and with a bit of playing around it should be possible to work out how to make more sophisticated plots. Mouse interaction with the plots have changed (also since v4.0), and the navigation is much more responsive. 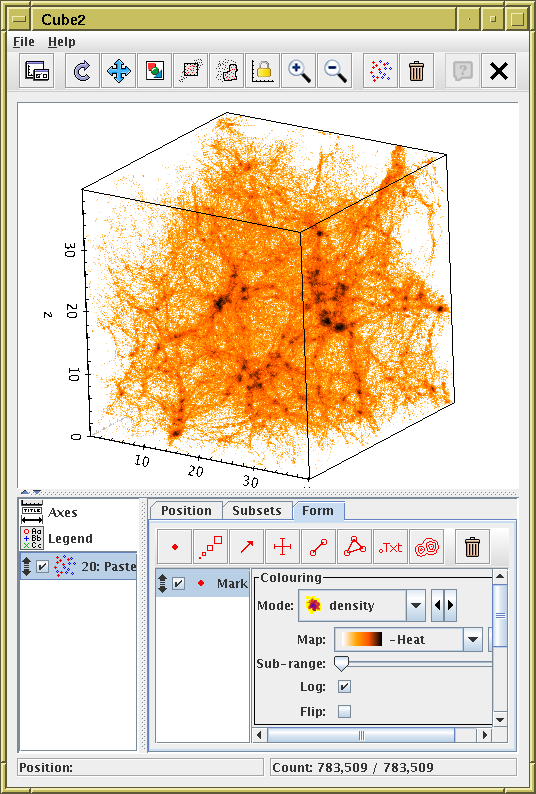 It's much easier to navigate round 3d plots especially than it used to be; a 3d zoom now leaves the axis cube in the same place, but zooms the space within it, which works much better than the old-style plots. Zooms around the position of the mouse in 2d, or about the center of the view cube in 3d. Stretch zoom around the mouse position: zooms in both directions independently in 2d, zooms isotropically in sky/sphere, zooms in two facing directions in 3d. Frame-zoom (like in old plot windows) in 2d, Pans in two facing directions in 3d. There are however quite a few more options. Detailed navigation help is available for each window in the footer panel (below) or by clicking the little question mark in it. Full documentation can be found in the manual.